Dr. Beat von Rechenberg, former stagiaire, provides outstanding leadership to the Swiss Bar, having served as President of the Swiss Bar Association (2011–2013) and as the President of the Zurich Bar Association (1999-2000). He presently is deputy member of the Board supervising the conduct of the members of the Zurich Bar. Dr. von Rechenberg received the M.C.J. degree from New York University and served an apprenticeship at the firm, then known as Fox Glynn & Melamed, in 1978. He has achieved prominence as a partner in the firm of CMS von Erlach Henrici AG in Zurich. 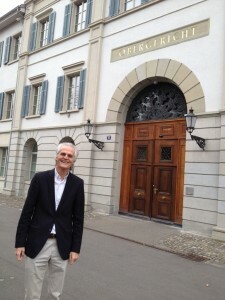 Donald Fox met with Dr. von Rechenberg recently in Zurich and took the below photograph. We congratulate Dr. von Rechenberg for his achievements, in which we take great pride.